The Seaquarium is a must-see attraction in Miami, an outdoor, 38-acre aquatic theme park that has dolphin, killer whale, and sea lion shows, touch pools for stingrays and bamboo sharks, and exhibits with penguins, sea turtles, manatees, and more. The park also has a pirate playground, an aerial obstacle course called Sharky’s Sky Trail, a 300,000-gallon reef aquarium, and plenty of smaller fish tanks and food stops. A handy map comes with a schedule of numerous events that you can plan your day around. But for us, the big thrill of the Seaquarium is the close-up adventures. We only had time on our Miami trip to swim with dolphins, but you can also swim with seals and pet penguins. Their VIP Tour gives you a personal tour guide to take you feeding stingrays and sea turtles, meeting macaws, and taking part in a training lesson. Or go underwater with Sea Trek, which is like scuba but is far easier and requires no training — you simply walk on the bottom of the pool with a helmet of air. You can also be “trainer for a day”, where you go backstage and learn how the animals are trained and take center stage in one of the shows. The dolphin experience at the Seaquarium was 30 minutes, longer than the encounter we’d had previously with dolphins at Discovery Cove in Orlando, and felt less corporate, too. You wait comfortably in the gift shop, sign a waiver, and then are given towels and allowed to change into swim clothing and a wetsuit for the slightly cold water. Behind the gift shop is a very large pool where you stand in shallow water to greet the dolphins. The Dolphin Odyssey which we experienced included a swim with the dolphin, unlike the less expensive but similar Dolphin Encounter. They take place in a group of people and are fully choreographed, similar to Discovery Cove. Sometimes the photo ops distracted from just experiencing and bonding with the creatures, unlike our more intimate encounters with land creatures at Jungle Island. We didn’t become friends with the dolphins. However, you get to do everything you can think of with them! You give them a kiss, a hug, give their fin a handshake, get splashed by them, and get to feed them. They give you snorkel masks and you get to put your head underwater to watch what the dolphins look like swimming below the surface. You even get to hang on and get taken for quite a long swim. Those dolphins swim so quickly! They drag you through the water while you hoot in amazement, perhaps 50 meters over 20 seconds. It’s quite a lot and we got to ask questions and learn about the dolphins and their behaviors. The animals seem well treated and eager to play with us. Pro tip: you needn’t show up early for your scheduled dolphin swim. Parking at the Miami Seaquarium is $10. A photographer from Magic Memories, a separate organization, takes professional photos of all the action. 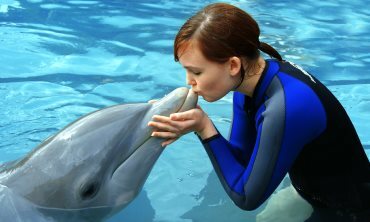 Staff were accommodating to our special requests, we did not get rushed along if we took an extra moment in each stage of the dolphin program, and the photos came out perfect. Just be prepared for a significant extra expense, but you will look great in the photos. Swimming with a dolphin is a bucket list item that’s astounding and a tale that you’ll tell for the rest of your life. I’m glad to give the dolphin experience at the Miami Seaquarium a full 5 stars and look forward to exploring the rest of the extensive attraction!